On the 16th of September, 2013, I left Cambridge in Massachusetts for Bar Harbor and Acadia National Park of Maine, by way of I-95 and my Prius. My trip north was a straight shot compared to Thoreau’s arduous journey in the 19th century, but the Maine woods remain a scenic destination for leaf-peepers, nature lovers, adventure-seekers, ecologists, and botanists. Over three field seasons at Acadia National Park I have sifted through archives for historical data on the abundance of plants; I have digitized a small herbarium to capture past dates of flowering; and I have hiked transects across the ridges of Mount Desert Island recording leaf out and flowering at various elevations. This trip marked the beginning of a new project. 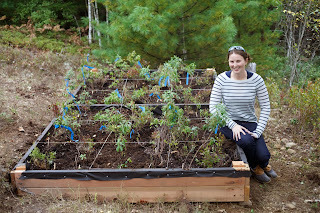 I spent two weeks in Maine setting up a common garden experiment, constructing raised beds and filling them with native transplants. 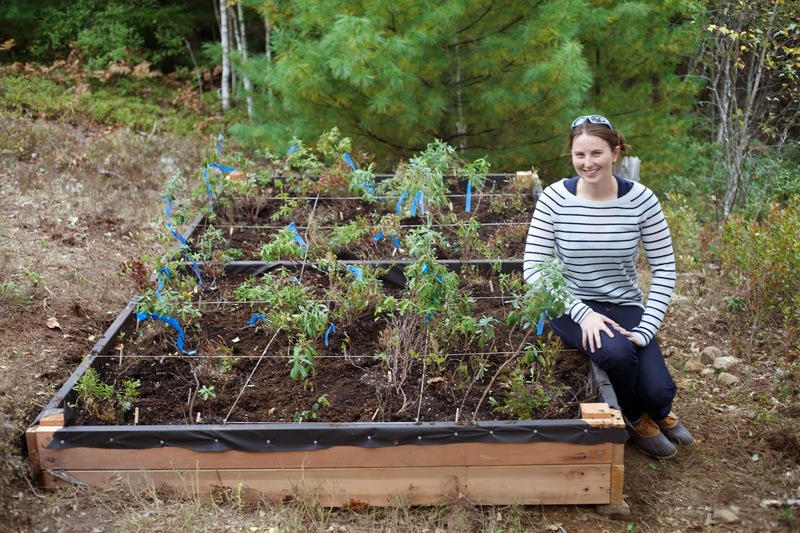 With this experiment, our research shifts from describing changes in plant phenology to testing the mechanisms that underlie their responses. Common garden experiments are a classic method for determining reaction norms in plants. Transplants from different provenances are grown together in a common garden to isolate the effects of genetic adaptations under uniform conditions. Clausen, Keck, and Hiesey’s (1940) iconic reciprocal transplants featured cloned Potentilla glandulosa ecotypes in gardens established along an elevation gradient in the Sierras. 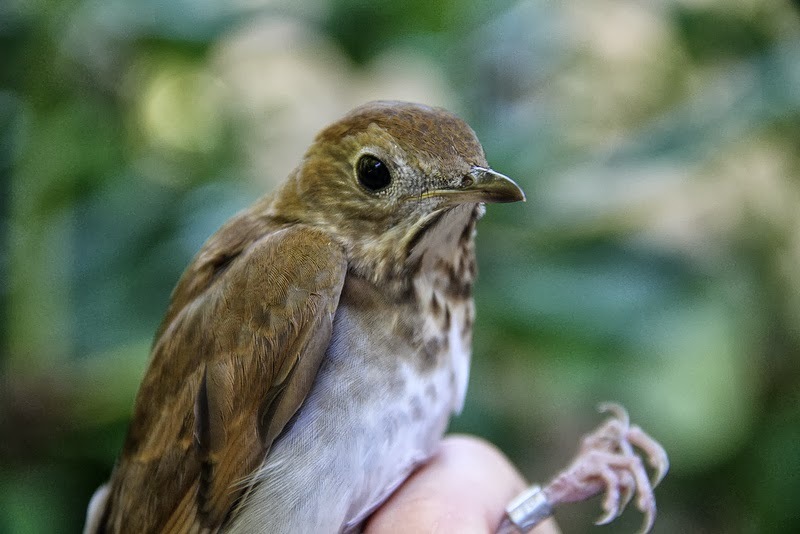 The experiment revealed both phenotypic plasticity within ecotypes and genetic differences between them. 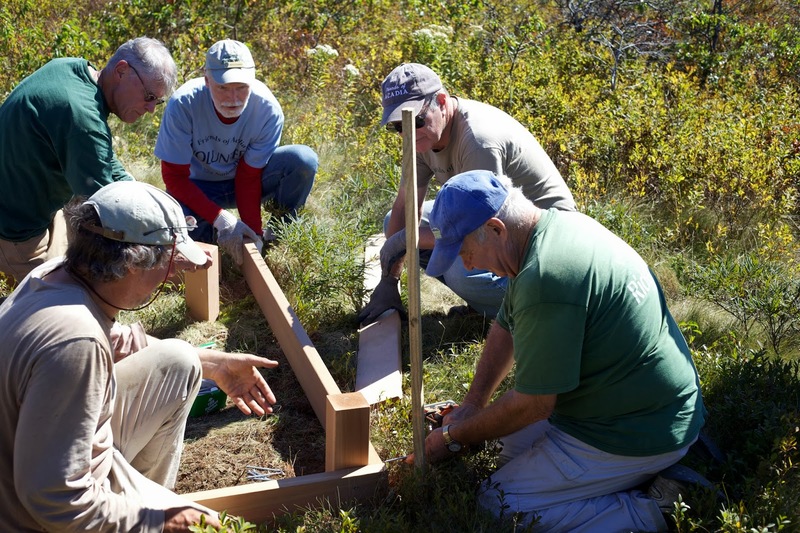 In Acadia, we have a compressed elevation gradient, from sea level to the 1532’ summit of Cadillac Mountain. 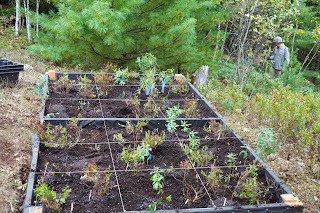 Many common plant species — including low bush blueberry (Vaccinium angustifolium), sheep’s laurel (Kalmia angustifolia), and three-toothed cinquefoil (Sibbaldiopsis tridentata) — grow along this entire gradient. Work in Thoreau’s Concord has revealed that the spring phenology of these species is correlated with temperature. This experiment will test for local adaptations for responsiveness in flowering and leaf out phenology among populations from different elevations. Will blueberries from the cold, windy summit leaf out and flower readily in the mild conditions below treeline? Or will they lag behind the plants from lower elevations when all of them are transplanted into the same garden? Setting up this experiment was a huge undertaking. 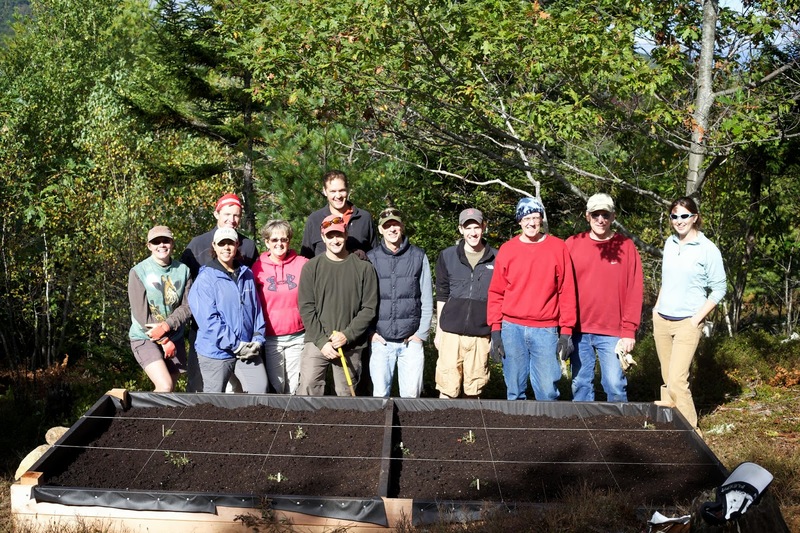 I worked with Friends of Acadia, a nonprofit organization that sponsors volunteer mornings in the park, to construct 6’ x 12’ raised beds at the base of Cadillac, halfway up the mountain, and just below the summit. We filled the beds with 70 cubic feet of topsoil to control for differences in soil depth and nutrients between sites. 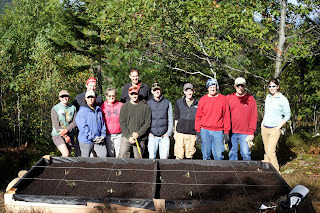 Moving 70 cubic feet of soil from the road to a raised bed tucked 150 meters into the woods via a bucket brigade over rocky trail-less terrain is quite a feat. We did it three times! My volunteers were amazing, upbeat, and dedicated workers. We had great fun (and great weather!) clearing the sites, hauling lumber, constructing the beds, moving soil, digging up, transplanting, labeling, and watering plants over a two week period. As I patted soil around my last three-toothed cinquefoil transplant on Friday afternoon, I couldn’t believe that just fourteen days earlier the site had been a patch of blueberries and sheep’s laurel, interspersed with glacial till and only a wisp of blue flagging around the lower branch of an oak tree to foretell it’s future transformation. What an impressive makeover! I’m looking forward to returning to the gardens in the Spring for our first season of data collection!